Are you up to date with the latest guidelines on doing keyword research? 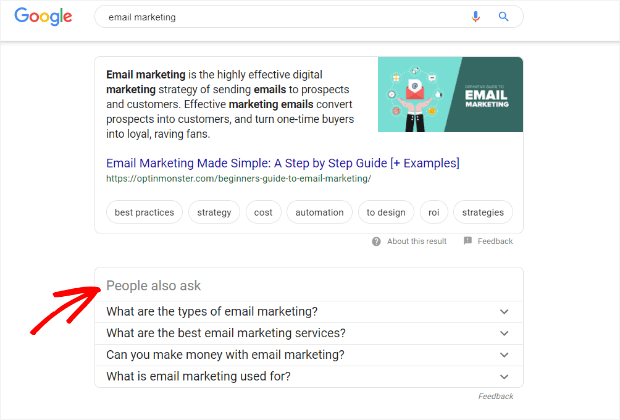 Researching keywords has been an essential part of both search engine optimization (SEO) and content optimization from the beginning, and it’ll help with email marketing, too. But it’s sometimes hard to choose the right terms for Google. There’ve been a lot of changes in search behavior and search guidelines in the last few years, and they’re constantly evolving. If you want your web pages, content marketing, and email marketing to deliver optimal results, then you’ve got to understand how to research and use keywords in the current environment. Recommended Resource: Need more website traffic? Learn how to rank #1 on Google with our Ultimate Guide to SEO. In an ideal world, these keywords are the same, bridging the gap between your content and your audience, and helping them to find it. Keyword research is the practice of finding the terms that people enter into search engines so you can use them for web pages, content creation, and marketing. As we said earlier, keyword research is a crucial part of SEO. Keywords are an important SEO ranking factor that Google uses when it’s deciding where to rank your content in search results. Get them right, and Google will understand what your content is about, making it easy for it to pop up at the right time in response to a search. Keyword research helps you get into your customers’ heads by finding topics to include in your content strategy. When you know what your target audience is looking for, you can optimize your content to deliver the answers they need. Overall, keyword research supports not just content creation, but all marketing and promotional activities, including email marketing. It will also help with pay per click advertising and competitive research. Checking out the keywords your competitors are targeting can help you refine your own content strategy. There are some tools to help you with competitive keyword research in our tools section below. Some people wonder whether it’s worth doing keyword research at all. The short answer: yes, it is. But not if you’re trying to do SEO like it’s 2006. In the past, one of the aims of keyword research was to stuff your content with terms people were looking for and artificially push pages to the top of the search results. Quality was often seen as less important than the right keyword density – having a certain percentage of the same keyword within the content. That kind of approach no longer works. In fact, it’s more often penalized than rewarded. Google keeps tweaking how its search algorithms work to try to deliver search results more relevant to what people want to find. People are using mobile devices with digital assistants which allow them to search by voice. That means they are using natural language and asking questions, not just typing in search phrases. Google tries to bring up immediate answers to many queries via Answer Boxes. These are usually based on well-optimized, relevant content. Semantically related keywords are now a thing. You don’t just optimize content for a single target phrase, but for related phrases that mean basically the same thing. We’ll look at that later in this guide. The bottom line: keyword research helps you optimize content for people first, and bots second. Head keywords are usually just 1 or 2 words and have a high search volume. Body keywords are 2 to 3 word phrases with a good search volume, not high, not low. Long tail keywords consist of four or more words strung together with a low search volume. These account for the bulk of web traffic. You may also see the terms head, modifier and tail keywords or short, medium and long tail keywords. The important factor here is specificity. The longer the phrase, the more specific it is, and the fewer search results there’ll be when people type it in. If you search for “t-shirts,” you’ll get millions of search results. If you search for “blue t-shirts,” you’ll likely get hundreds of thousands. If you search for “blue American Apparel t-shirts,” you’ll get much fewer results that more closely match what you’re really looking for. From a user’s viewpoint, the more context you add to the search terms, the better the results you’ll get. Another term you’ll hear is semantic keywords, which are related to latent semantic indexing (LSI). LSI is a bit like search engines using word association to decide what you’re really looking for. For example, if you were searching for “Titanic”, the search engine would use the context you provide with other search terms to decide whether you’re looking for information about the ship or the top-grossing movie. Since LSI helps search engines provide more relevant results when people search, part of a good keyword research strategy involves finding LSI keywords to use in your content. Want to see LSI in action? Look at the autocomplete results when you type a word or phrase into the Google search box. This list changes as you add words to provide context. You can also look at the related search terms shown at the bottom of your results page. Note that if you change search parameters, this list disappears. 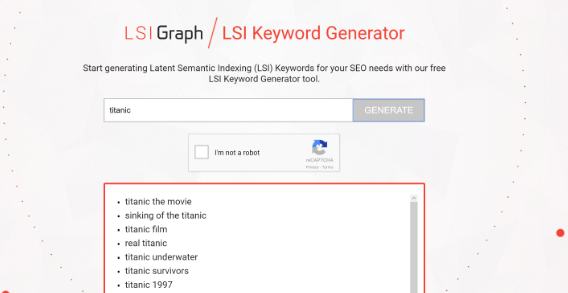 A good tool for finding LSI keywords is LSIGraph, which gives you a longer list than the eight or so terms Google provides. While some entries will leave you scratching your head, others will provide an aha moment for content creation. Using semantic keywords gives your content even more potential relevance and reach. However you describe keywords, it’s not just enough to understand whether they are short, medium or long tail. To make the most of keywords for marketing, content creation and SEO, you also have to understand the intent of the searcher who uses them. When you understand search intent, you turn into a mind reader, able to deliver exactly what searchers want. Navigational, where users search for a particular website. Informational, where users search for the answer to a question. Investigational, where users search for information that may eventually lead to a transaction. Transactional, where users are ready to buy. How are these different from each other? A description of a typical search process helps to explain. Let’s say you were thinking of buying a phone. You’d start with informational keywords to figure out what options are available. These are often question-based phrases, asking where, why and how. While you’re doing this, you might come across a couple of brands that interest you. In researching them, you might type their name into the search box to find the URL for their site. That’s a navigational search. Once you start looking for comparisons, then that’s likely an investigational search, though there’s still an informational element. Transactional keywords usually include words like buy, purchase, etc., with a precise description of what the person is looking for. And commercial intent keywords are those which relate to your business and attract people who might want to buy. 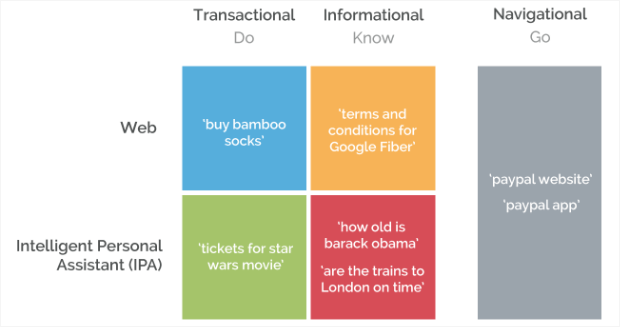 While navigational keywords remain the same, transactional and informational keywords change depending on whether they are made via a web search or an intelligent personal assistant like Google Assistant, Siri, Cortana or others. Know (including Know Simple). Know is about finding information, while Know Simple is about finding a specific answer to a question, like a fact. Do (including Device Action). These involve performing an action or accomplishing a goal. If you search for a game, for example, it’s likely that you want to install it. Website. This is a query aimed at locating and visiting a website. Visit-in-Person, where mobile device users are planning a physical action based on search results, like finding a nearby Italian restaurant to visit. When you know how to categorize the keywords you find in your research, you can use this information to help with content strategy and to ensure that you are meeting users’ needs wherever they find your information. As you can see, keywords have a lot to do to meet both your needs and those of your searchers. Of course, they’re really the same thing. When people find what they need in search results, and come to your site and convert, then everybody’s happy. So how do you come up with a list of words and phrases you can use? The first step is easy: brainstorm. If you know your niche, you’ll have a good idea of the kind of information people need at each stage of their interaction with you. If not, think about what you’d search for. Use this as the starting point for a list. It’s a good idea to use a spreadsheet for this as most of the tools you’ll use will allow you to export data as Excel or CSV files. While you’re at it, think about seed keywords. These are phrases that don’t have a modifier, and they’re the building blocks of your keyword list. For example, “health insurance” is a seed keyword, while “health insurance benefits calculator” is long tail. Find related terms by using LSIGraph, mentioned earlier. Just type your search term into the box and you’ll get a long list of related terms to add to your list. You can also find out which search terms are already bringing people to your site, as a starting point for generating new, related terms you can use for SEO, content development and marketing. Two places to find these are Google Analytics and Google Search Console. 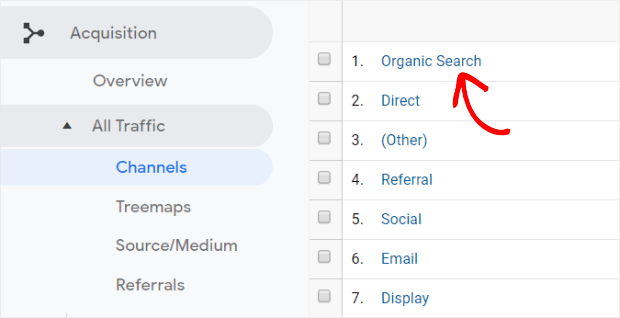 To find keywords in Google Analytics, go to Acquisition » All Traffic » Channels and click on Organic Search in the table. You’ll see a list of phrases. However, the largest group will be “not provided”, which are a result of encrypted browser searches. If you have linked a Google Search Console account to your Google Analytics account, then while you’re in Analytics, go to Acquisition » Search Console » Queries. You’ll see more data, and fewer “not set” keywords. Blog comments, making note of when people ask about certain topics. Social media hashtags are essential keywords, so see what people use when sharing your content. Book titles and categories on Amazon. Don’t forget about local search, which has become more important as searchers have gone mobile. A place name can also be a useful search term modifier, so if your business serves a particular locality, consider this as part of the keyword generation process. That also applies to seasonal search terms. The methods above are just a starting point for your research. If you really want to get serious, you’ll need to use some purpose-built keyword research tools to evaluate the terms you’ve already identified and to find brand new ones you haven’t even thought of. Many of the tools listed below can help you analyze other aspects of your website’s performance, not just keywords. But even if you’re just looking at keyword data, these tools can give you information like search volume, ranking difficulty (useful for content strategy and SEO), keyword value (useful for pay per click advertising), competition and more. There are dozens of keyword research tools, but here are some of our favorites to get you started. Read our guide to learn more about these keyword research tools. By the time you’ve used a few of these keyword tools, you’ll have a long list of terms that people may use to find your site. How do you know which ones to use where? If you’re planning to use your keywords for advertising, you’ll want to plug them into Google AdWords Keyword Planner so you can figure out which ones will work best for that purpose. It’s worth noting that though popular terms can be expensive, you can also do well with related keywords that are slightly less popular. But if you’re planning to use keywords for SEO, content creation and marketing, you’ll be more interested in how easy it is to achieve a good search position for content using those keywords (keyword difficulty) and whether you can rank at all (keyword opportunity). You can also divide up your list strategically. For example, some of your keywords will be directly relevant to your business, while others will be related to user intent. You can also group keywords according to the topics you want to cover. Remember when we talked about keyword intent? You’ll need to create content to match different types of intent. In other words, don’t just focus on commercial keywords, because people will use other types of keywords before they’re ready to buy. A good content and marketing strategy will include all types. Once you have a final list of keywords, then you can use this information in lots of places in your content. The title of your page. That’s both the actual title and the SEO title, which might be slightly different. The title’s a starting point for Google determining relevance, and it’s the clickable link you see in search results. The meta description. If you don’t use an SEO tool, then this will automatically come from the first 160 characters of your content, so that’s a good place to use keywords too. The meta description provides the description that’s below the clickable link and helps people decide to click – or not. Links and social media updates. If you’re sharing site content, this may already be part of the title, but you can also help people refine their searches by adding an appropriate hashtag, which is also effectively a keyword. Recommended Resource: Do social media shares count the same as backlinks? Google says no, but are they telling the whole story? Find out the truth in our guide to Social Media and SEO: Do Social Shares Really Matter for Ranking? Of course, you’ll also use keywords and related terms throughout your content. Avoid keyword stuffing, though – it’s considered a black hat SEO tactic and will backfire. Have your main keyword in mind and then use variations, so you write like a human being for human beings. When you’re done, check back to see if you can include additional semantic keywords without compromising readability and content effectiveness. See our guide on how and where to use keywords for SEO for more details. 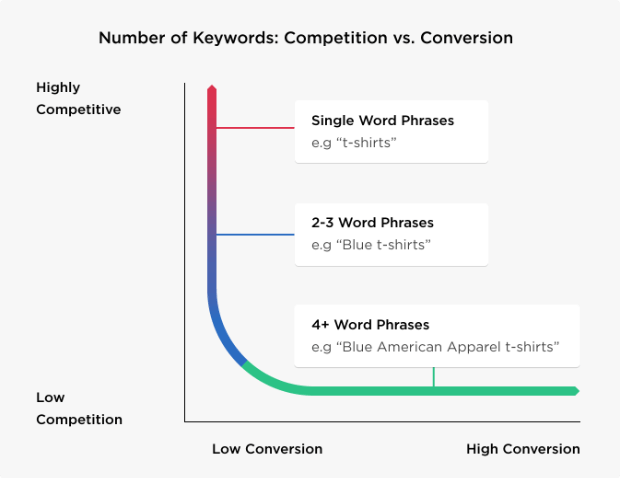 Now you know how to use keyword research to choose the right terms for Google and help your target customers find your content. Don’t forget to periodically perform an SEO audit to catch any errors that might be tanking your rankings and traffic. And, be sure to download our reference guide: How to Choose the Right Keywords for SEO. This guide gives you the highlights of this post—everything you need to choose the right keywords to boost traffic and improve rankings. Hi! I have done my reseach but truth is, I’m overwhelmed by the amount of keywords I could use. How do I actually determine which ones to choose? If I choose a low volume keyword, will people actually find me at all? Hi Vivian, using a combination of keywords will help you be found. SEMrush has some excellent tools to help you with this. We talk about this in more detail in our SEO guide. article is very informative and easy to read. I’m a beginner with SEO and I feel like i have a foundation to build on. Thank you! Thank you for the excellent article on how to research which keywords are best to use. If you do not mind i shared it across me various social media pages. Hi there , are you guys affiliated with the search tools you are referring to us? OptinMonster doesn’t have affiliate agreements in place with any of the search tools mentioned in this post, no. One of our sibling sites does have an affiliate agreement with SEMRush. Thanks for one of the most intriguing tech articles I’ve ever read Sharon! I’ve learned more about SEO from your ideas than some much-more-involved courses on similar subjects. Your well written and easy to understand style helped me to soak in most of the content and I’ll be using the new-found knowledge for the rest of the day. What stat in Keywords Everywhere is most helpful in choosing a keyword, Monthly Volume, COC, Competition? Hey Allyson! I’d go with Monthly Volume since that tells you roughly how many people are searching for that particular keyword phrase in a month. It’s basically the word’s popularity with searchers. Thanks for sharing the information. I understand the keyword search for SEO is important to get high rank on search engines. First, find the right keyword is important to rank the website or blog in search engine. Hi, Thank you for the valuable post.this will be really helpful to the SEO.